Ananka's Diary: Dine . . . and Die! oops. I meant, she says it's supposed to be delicious....not that she's ever tried it!! That is both fascinating and disgusting. I think my favourite out of the 7 is the Ackee Fruit. Not because I know anything about it, but because I'm really interested in the medicinal properties of plants and herbs. I actually once made this "perfume" from some stuff in our garden that gave my mum a terrible rash and a headache. I felt so bad - it was supposed to be her birthday present. Oh, and I've had cassava. xD I found this bread made out of it at the health food store. Raph: LOL! I feel bad for your mom. about Paris' Shadow City. Have you actually been down one of the manholes?? Hey, didn't you post that picture of the jellyfish? Jin Ai: As a result, whenever I give her birthday presents, I test them on myself beforehand. In front of her. Raph: You still make your presents? lol. What kind of things do you make for her? OH MY GOSH!!!! I KNOW THIS IS OF SUBGECT BUT MARY KAY TESTS THERE MAYCUP ON ANIMALS. THEY INJECT NAIL POLISH IN TO THERE BUTTS AND 50% DIE!!!!!!!! Nellie: Haha. ^^ I guess it's insurance - and thanks. I always make my own gifts! I like to make little, funny books for people on their birthdays. It's sooo much better than something store bought. Now that I've heard Raph's tragic (and hilarious) story, I won't try my hand at purfume! But how cool that you tried! I'm so impressed. Same Anonymous: Awful, isn't it? Where did you hear about it? Aw, puffer fish are too cute to eat. So are octopi for that matter. risk your life for some food? i don't think sooo. It probably doesn't even taste good! I've seen that octo thing on fear factor before ._. 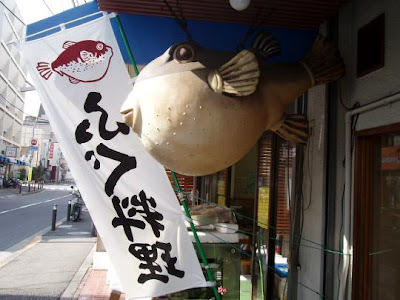 At first I thought that the dine and die thing was about puffer fish, since I know that they are poisonous even though Japanese ppl eat them anyways. "We are gathered here today to mourn over Sophie Fisher. She chocked on live octopus in South Korea while vacationing this summer..."